01.04.2019: Cong Jiang joins the group. He will work on regional modeling and applied geomorphology. Welcome Cong! 15.03.2019: Merve Seçkin-Kryger starts her PhD at German Aerospace Center as new CompGeo group member. Welcome Merve! 12.03.2019: Xin Yin joins the group. She investigates Aeolian processes by means of LES simulations. Welcome Xin! 18.01.2019: Julia Muchowski wins the Poster Prize of Cologne Geosciences GSGS Conference 2019 for her poster "Atmospheric Boundary Layer Flow at the Sand Interface"! 20.08.2018: Maria Determann starts her Master Thesis in the group. She will work on the implications of climate change for coastal geomorphology. Welcome Maria! 29.06.2018: Izael Lima successfully defends his PhD Thesis. Congratulations Izael! 01.02.2018: Julia Muchowski starts her PhD in the group. She will work on modeling of aeolian processes. Welcome Julia! 01.02.2018: Filip Elekes successfully defends his Bachelor Thesis on DEM simulations of granular materials on the moon. Congratulations, Filip! 01.12.2017: Laura Theissen starts as Student Assistant in the group. She will work on simulations of geochemical cycles. Welcome Laura! 01.09.2017: Sandesh Kamath starts his PhD in the group. 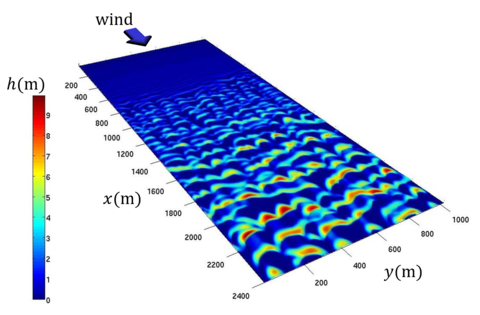 He will work on particle-based modeling of wind-blown sand and dust. Welcome Sandesh! 01.09.2017: Filip Elekes starts as Student Assistant in the group. He will work on DEM simulations of granular materials. Welcome Filip! 01.04.2017: Izael Lima starts as Guest PhD student in the group. He will work on CFD modeling of aeolian processes. Welcome Izael! 15.11.2016: Mateusz Kryger starts his PhD in the group. He will work on morphodynamic modeling of dunes. Welcome Mateusz! 10.11.2016: Mateusz Kryger successfully defends his Master Thesis on dune modeling combining simulations and digital elevation data. Congratulations, Mateusz! 04.11.2015: Dr. Eric Parteli becomes editorial board member of International Journal of Earth & Environmental Sciences.